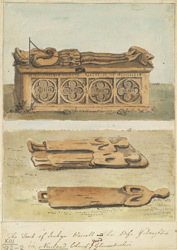 Drawing of some tomb monuments from All Saints, the parish church of Newlands in Gloucestershire. This medieval church is exceptionally large and has one of the finest collections of medieval tomb monuments in Gloucestershire. The first is a effigy of a male recumbent on a tomb chest. Although the man is described as Jenkyn Worrell is is possibly the tomb of John Wyrall, Forester of Fee d.1457. He has a horn hanging to the right and his feet rest on a hound. The sides of the tomb chest have four panels of quatre foils. The tomb chest appears to lie in the church yard rather than inside the church. The bottom image, is of three flat figure shaped monument slabs, although there are few details which make them identifiable.